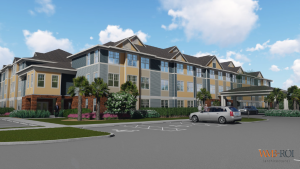 Lakeland, Fla. (June 4, 2018) – Housing Trust Group (HTG), one of the nation’s largest developers of affordable housing, and the Lakeland Housing Authority closed on financing earlier this year for the redevelopment of West Lake Apartments, an aging public housing complex located on the southern tip of Lake Beulah in Lakeland, Florida. With demolition of the 1960s-era apartments already underway, an official groundbreaking ceremony for the new development was held at the property, located at 501 Hartsell Ave, at 10 a.m. today. Twin Lakes Estates is the first of three planned phases of development which will redevelop the old 120 units that formed West Lake Apartments into a modern development with 318 new one- and two-bedroom affordable apartments for seniors, along with multiple community amenities. Monthly rents will range from $591 to $808. The first phase of development will create approximately 50 local construction jobs, and three permanent jobs on site. Phase one of Twin Lakes Estates was financed with an $8.3 million construction loan from US Bank backed with Multifamily Mortgage Revenue Note issued by the State of Florida through Florida Housing Finance Corporation (FHFC); $3.7 million in permanent financing from Freddie Mac though Walker & Dunlop; $6 million of 4% low-income housing tax credit equity through Raymond James; a $1.2 million AHP loan from the Federal Home Loan Bank of San Francisco; and a $5 million State Apartment Incentive Loan (SAIL) and $294,00 Extremely Low Income (ELI) loan, both from FHFC. The first phase of Twin Lakes Estates will consist of 100 units (50 one-bedroom and 50 two-bedroom apartments) in a single, three-story, garden-style apartment building. Ten apartments will be set aside for senior residents earning at or below 45% of area median income (AMI). The remaining units are set aside for senior residents at or below 60% AMI. Eighty of the units are to be assisted with Project-Based Vouchers. Amenities at Twin Lakes Estates that will serve all residents include a computer/reading room, community room with chef’s kitchen, theater room and a picnic pavilion with a BBQ grill within the building’s courtyard. Phase Two of the re-development – which will add 132 units for families – is slated to begin in January 2019. HTG has seven other affordable housing communities in various stages of construction in Florida including Hammock Ridge Phase II in Spring Hill; Arbor View in Margate; Heron Estates in Riviera Beach; Douglas Gardens V in Pembroke Pines; Princeton Park in Miami; Freedom Gardens Phase II in Brooksville; and The Addison in Bradenton.